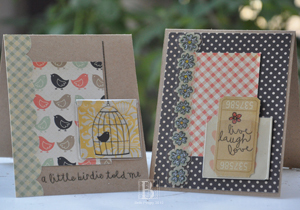 Just a quick one today, I’ve got 2 cards using the Fancy Pants Designs “Its the Little Things” for a SCRAPBOOK ADHESIVES BY 3L™ and Fancy Pants blog hop. You can see them larger on the SBAby3L blog…and then comment to win while you are there! This entry was posted in Card, SCRAPBOOK ADHESIVES BY 3L and tagged Fancy Pants, WorldWin Papers. Bookmark the permalink.